This article outlines how to create, edit and delete employee shifts. Once you have entered the details for a shift, click "Save" and the shift will be saved to the shift grid. You can quickly move shifts by clicking and dragging them to another shift tile. If you move the shift to another day, the date of the shift will be automatically updated. 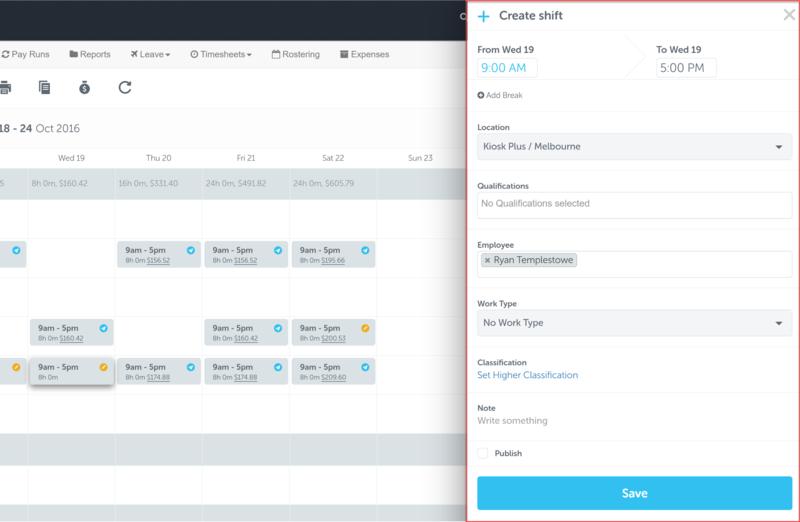 If you move the shift to another employee, the employee assigned to that shift will be updated automatically. You can quickly adjust the start or end of a shift in day view by clicking and dragging the start or end of a shift. As soon as you drag the shift to it's new start or end time, the new start or end time for that shift will be automatically updated.